In 2012 there were only around 25 nature preschools and kindergartens in the United States; now there are well over 250. It is a national movement that is gaining momentum. It is an exciting time because in principle these schools have within them the kernels to transform the world through increasing children’s direct interaction with nature and a more wild nature than that exists in most urban children’s lives. In this paper we begin to characterize forms of child-nature interaction that occur in one specific nature preschool, Fiddleheads Forest Preschool in Seattle, Washington, USA. 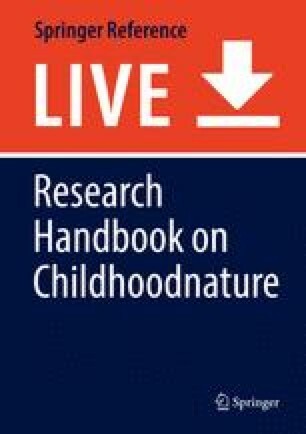 Based on our observational data, derived through a randomized time-sampling methodology, we modeled child-nature interaction using what we call interaction patterns: characterizations of essential ways of interacting with nature described abstractly enough such that the pattern can be instantiated in different ways, across diverse forms of nature. Specifically, we use a nature language to describe (with photographs) eight interaction patterns: leaning on and hanging from supple tree limbs, climbing high in small tree, looking at wild animals, imitating animals, imagining nature to be something other than it is, making boundaries on earth, pushing the edges of boundaries, and waiting attentively in nature. Through an interaction pattern approach, we seek to provide insight into what is actually happening on the ground at a forest preschool and how that provides a key solution to the problem of environmental generational amnesia. Dennie, J. O. (2011, January 5). 40 years later, ‘The tragedy of the commons’ as relevant as ever. Digital Journal. http://www.digitaljournal.com/article/302211. Retrieved 4 Dec 2017. Frumkin, H., Bratman, G. N., Breslow, S. J., Cochran, B., Kahn, P. H., Jr., Lawler, J. J., ... Wood, S. A. (2017). Nature contact and human health: A research agenda. Environmental Health Perspectives, 125(7), 075001-1. https://doi.org/10.1289/EHP1663. Gramopadhye, A. (2013, March 12). The tragedy of the commons in the real world. https://blogs.commons.georgetown.edu/phil-108-spring2013-amg252/2013/03/12/47/. Retrieved 4 Dec 2017.